The Hattrick Federatie Rotterdam (HFR) is an extremely active federation in the world of Hattrick with a lively conference page, many get-togethers and (of course) a high level of comradery. 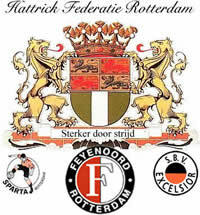 The HFR was founded on the 13th of January 2003 by Lantalume (of Ainulindalë FC), Legionair (of SC Amersfortia) and Raateland (of Real Raateland) as a Hattrick Federation for Feyenoord supporters, people from Rotterdam (and around) and supporters of other Rotterdam clubs. The HFR organises its own cup tournament, the József Kiprich Trophy, which was founded by Lantalume and is currently managed by Grootveld (of FC Rotterdam 2003). The József Kiprich Trophy was first organized in season 7 and has since then boasted many (in)famous winners. A special place to honour our former worldfamous members of the HFR. The tournament of the Hattrick Federatie Rotterdam (HFR) is named after one of the greatest hero's of the Feyenoord history: József Kiprich. In season 7 HFR-founder Lantalume decided that former forward of the Dutch IRL team Feyenoord deserved a dedication, so he founded a friendly-cup for the Hattrick Federatie Rotterdam where József Kiprich is to be honoured. Since season 12 is the organisation of the JKT in the goods hands of Grootveld (manager of FC Rotterdam 2003). How to make your life even more cheerful? With some nice HFR Goodies! Like an original HFR Beermat! De Hattrick Federatie Rotterdam (HFR) is een zeer actieve federatie met een zeer actief, gezellig forum. De HFR werd opgericht op 13 januari 2003 door Lantalume, Legionair en Raateland. Het werd een federatie voor supporters van Feyenoord, Rotterdam en overige Rotterdamse clubs zoals Sparta en Excelsior. Enkele pijlers binnen de HFR zijn de József Kiprich Trophy, het zeer actieve forum en de HFR Meetings & toernooien. This page was last edited on 15 November 2009, at 10:22.